Tired of bitter cold winters? A home in one of Florida’s 55+ communities may be just the solution you are looking for! Before you dive into a major purchase make sure you know what is in store. 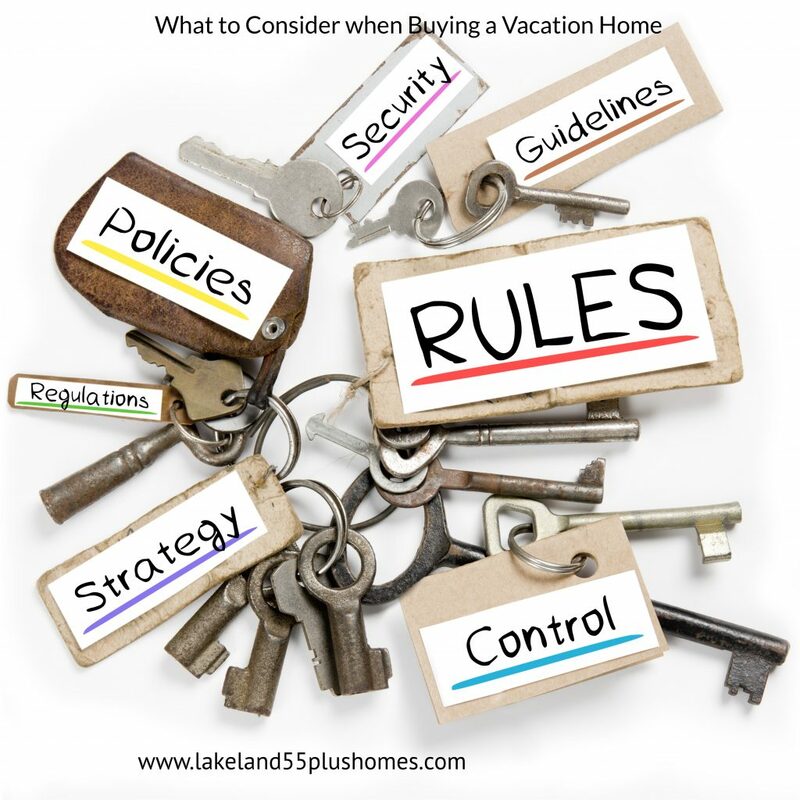 Below is a helpful guide to get you started on buying a vacation home. A 55+ or retirement community is a neighborhood that is built for adults who are ages 55 and older. However, the age limit is not always mandatory and residents can often be as young as 50 years old. On the other hand some retirement communities may have a starting age as old as 62 years for residents. Most seniors living in these communities are retired from their life’s careers but could still choose to work part-time or even more. 55+ communities can have single family homes, condos, townhomes or a combination of these. These communities offer older home buyers a variety of amenities, which are designed to make their lives easier, healthier and more enjoyable than it would be if they chose to buy in an outside neighborhood. In fact, the amenities of a 55+ community can be similar to living in a resort full-time. If you have considered buying a home in a 55 and older community, there are some things you should consider before you jump in. Buying a 2nd home is a big step and you will want to be prepared for the unique challenges buying in a 55+ community brings. One of the first steps of buying a vacation home is determining if you prefer a single family home, townhome or condo. Single-family homes can offer more privacy, but are more difficult to maintain if the community doesn’t provide maintenance and upkeep services. Condos and townhomes are less maintenance, but mean giving up a little privacy. Bigger living quarters mean higher utilities costs, maintenance, etc. Before you buy a winter home in one of Florida’s 55+ communities be sure you know which housing option is the best fit for your financial needs and lifestyle. 55+ communities offer housing with different features than you would find in traditional housing. Perhaps the doorways in the home are made for easy wheelchair access. Or the homes feature first-floor master bedrooms, so you do not have to worry about going up and down stairs repeatedly? These are important things to remember when purchasing a home in a 55+ community. Although handicap accessibility may not be an issue now, but it could be in the future. When you are living in a retirement community where activities and amenities abound, having a reliable management team is a necessity. When visiting different communities, be sure to talk with the management and residents. This will give you a better understanding of what you will be dealing with if you choose to live there. You wouldn’t want to live in a community with bad management or rude homeowners association leaders. You should also know the advantages and disadvantages of living in a community with a homeowners association. Upon purchasing a home in a 55+ community, you will sign an agreement that explains what you can expect from the community, and what the community expects of you. If you have not previously lived in a community with a homeowners association (HOA), you might be shocked to learn the limitations comes with it. There are often rules for parking, pets, decorating your home, lawn maintenance and more. Some 55 and over communities have rules that restrict who can live in the home. For example, sometimes both a husband and wife need to be at least 55 years old. Also, some fifty-five plus communities do not allow kids to live in the residence at all – even for short periods of time. These are just a few things to be aware of before buying your second home in a 55 plus community. Make sure you read the rules and regulation of the community before signing a contract for sale and purchase. Many 55 and over communities offer programs and activities for residents. Having things to do without leaving the community gates is one of the largest benefits of living in such a community. There is always something to do, and a chance to make new friends within the community. Some communities have a central focus, like golf, while others have a variety of activities available. Be sure to review the calendar of activities at each community to see what interests you. If you cannot get excited about what is offered at a given community, you may find another community is better suited to your lifestyle. Some people want amenities like a gym, swimming pool or tennis courts. Others enjoy daily activities such as a knitting or painting class, Bingo or Shuffleboard. Almost all 55+ communities require an ongoing financial commitment outside of your home purchase. Sometimes it is a HOA fee, maintenance fee, membership cost or a combination of these. It can get rather expensive. As a rule of thumb, the more services/amenities offered, or the more exclusive the community, the more it will cost you to live there. Be sure to choose a community that is within your budget. Think you have found the perfect community for your vacation home? Don’t forget how important it is to scout out the surrounding areas! Many buyers forget this step. Below are quick reference points that can help you choose the best neighborhood. What is the crime and safety rating of the neighborhood? What major highways and connecting routes are nearby? Is there easy access to grocery shopping, banks, the post office and restaurants? Are there entertainment or sports venues nearby? How far away is the nearest hospital? Are there things like railroad tracks, airports, major highways, etc. that will cause excess noise? Are there churches or synagogues nearby that fit your religious needs? Once you purchase your vacation home, selling again in a couple of years is probably not what you had in mind. Make sure you do your research on the community and area before buying. Assisted Living vs. 55+ Communities. One more important point to understand is that there is a big difference between assisted living facilities and 55+ communities. When someone says “retirement community” different things can come to mind. This is a great article that explains the various types of senior housing choices. Assisted and residential care homes are not the same things as an over 55+ community. There are some great options when it comes to choosing the best retirement community. Its normal to have trouble picking a clear winner. However, once you have evaluated all the important topics mentioned above, you will have to choose your favorite. Trust your gut and go with what makes you happy! A great source of information and professional help is to hire an experienced local real estate agent who understands your needs and also knows the various retirement communities and their amenities. Buying a vacation home in Florida may be different than buying a home in Michigan, New York or even Ohio. You definitely want someone who has your best interest in mind.